An engagement ring not only needs to fit her style, but it also needs to look good on her hand. Read on for tips for choosing a flattering ring for every type of hand. Choosing the perfect engagement ring is not easy. First, it needs to match her personal style. And you also have to consider her lifestyle and make sure it doesn't get in the way of her hobbies or work. And, of course, it needs to be within your budget. But there is one other important factor a lot of people forget to consider. And that is whether the ring will actually look good on her finger! Fingers come in all shapes and sizes. And not every style is one-size-fits-all. You want to make sure it will be flattering on her hand. For example, if she's got wide fingers, you don't want to get a ring that makes them look chubbier. Decide on the diamond shape. Elongated diamonds will flatter short fingers, while round diamonds will flatter wide fingers. Choose a flattering setting style. Solitaries will keep things simple on petite hands, while halos will help create more mass for large hands. Select a diamond. 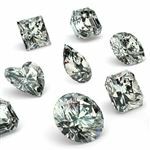 Learn how to save big on diamond prices. 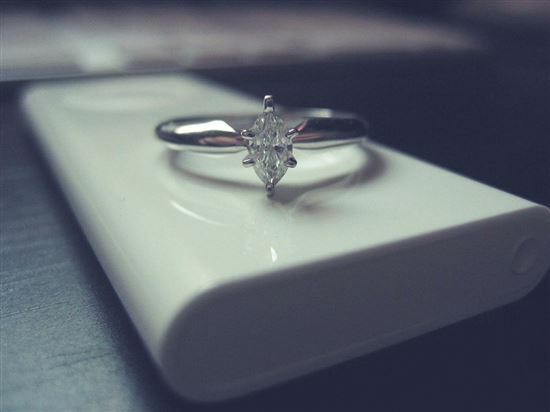 This may come as a surprise, but consider buying your engagement ring online. 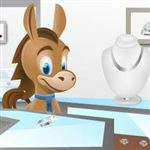 You can stretch your buying power because online retailers are around 40% cheaper than local jewelers. 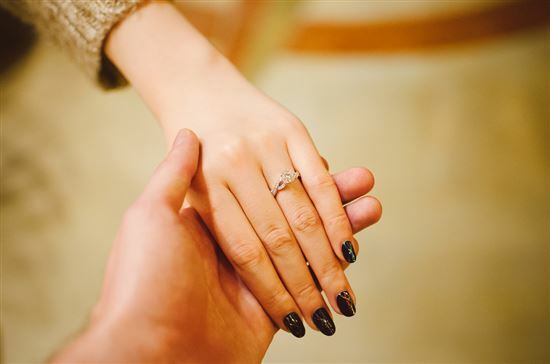 At minimum, you should at least visit Blue Nile and James Allen to get an idea of reasonable costs for diamonds and rings. If she has long, slender fingers, then your job is easy. Almost any style will look good on her. Long fingers can get away with small, dainty designs or large bold designs. In particular, a smaller center diamond with a medium-thick band is especially flattering, as it'll help widen the finger a bit. If you looking for an engagement ring for long fingers, be sure to check out James Allen's inspiration gallery. Stay away from: She can pretty much wear anything, but the marquise shape will make her finger look even longer. Short fingers don't necessarily mean thin - just short in length. 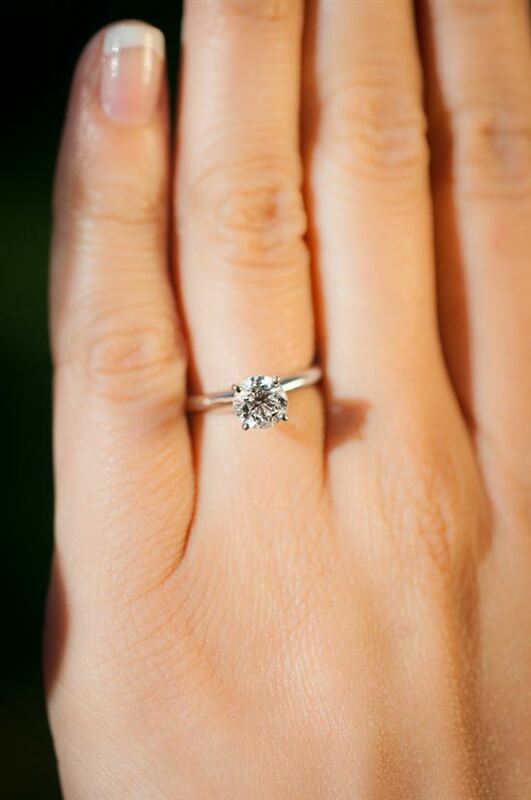 To help short fingers appear longer, look for elongated diamonds, like the oval, pear, emerald, or marquise shapes. Keep the band thin and delicate, so it doesn't cut off the fingers and make them look shorter. If she's got short, wide fingers, consider a thin split shank to add a bit more width to the band without making it chunky. 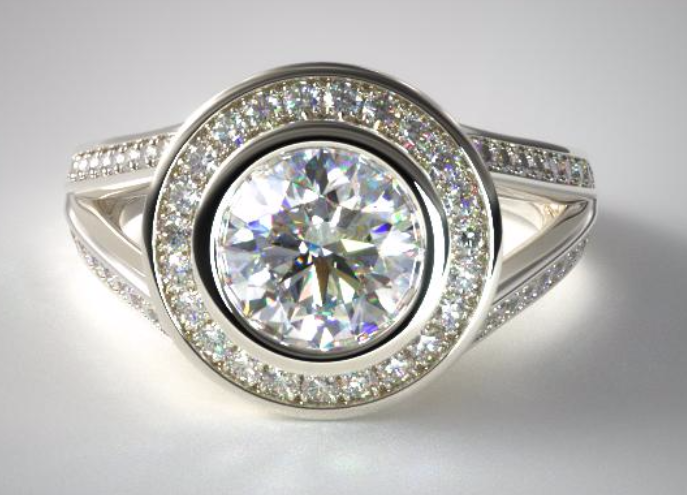 If you're interested for engagement rings for short fingers, check out oval diamonds on James Allen. Stay away from: Large round or square diamonds (they can make short fingers look stubbier), and thick bands. These fingers are perfect for a bold statement ring. You can go crazy with angular or asymmetrical designs. You want as little skin showing on either side of the center design as possible. If she's more traditional, a halo is a budget-friendly way to give the center more mass. Or a cluster setting is a relatively inexpensive way to get a large center. Larger shapes like emerald, oval, and pear will look good on this finger type. A thicker band will also minimize the appearance of wider fingers. Or a split shank (like the ring pictured above) is a great way to widen the band without making it seem too clunky. If you're buying an engagement ring for chubby fingers, take a look at halo rings on James Allen. Stay away from: Narrow center shapes (like the marquise cut) and thin bands. If she has thin fingers, then simpler rings with thin bands won't overpower them. Also, diamonds with smaller carat weights will look better proportionally (so great news for you!). Small round, oval, princess, or heart shapes look especially good on small, dainty fingers. For engagement rings on petite fingers, check out Princess diamonds on James Allen. Stay away from: Huge statement designs, large solitaries, and wide bands. It's all about proportion. So if her hand is small, a smaller diamond will look larger on her hand. Keep the design less elaborate; you don't want it to look too imposing. 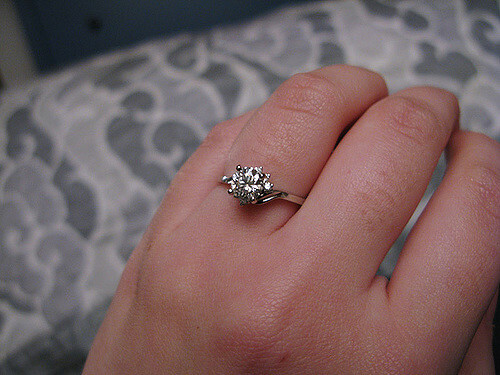 A simple solitaire is best and makes enough of a statement on those tiny hands. A thin, delicate pavé band is a great way to add some extra sparkle without going over the top. For small hands, look at 1 carat diamonds on James Allen. Stay away from: Large statement rings and thick bands. On the other hand (ha! ), larger hands will need a larger design to make the ring look proportional to her hand size. If you don't have the budget for a bigger rock, a cluster or halo will give you more mass for the money. Funky designs and chunkier settings will also complement larger hands. For larger hands, check out 2 carat diamonds on James Allen. Stay away from: Small solitaries and thin bands, as they'll look extra small. Take these tips as general rules of thumb, not gospel. What's still most important is that the ring is in a style that she absolutely adores and matches her personal taste. 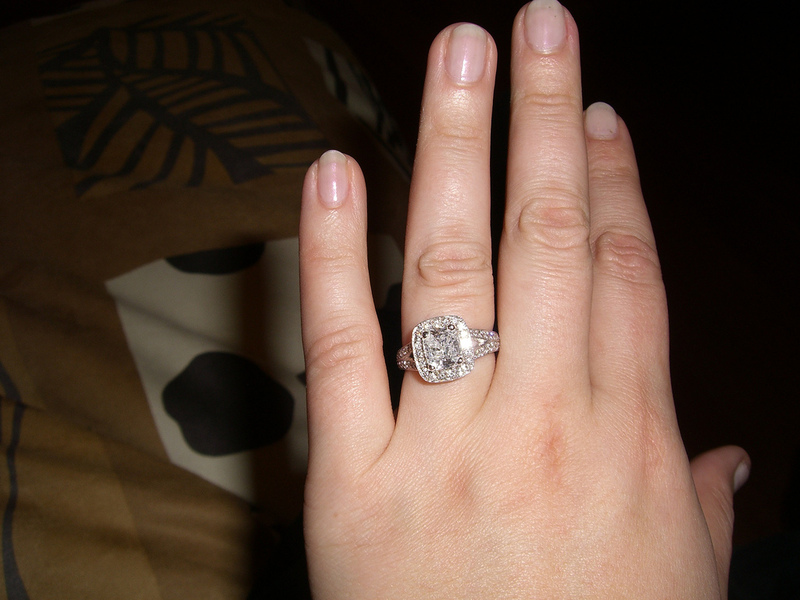 And, of course, don't go over budget trying to get a large carat diamond for your sweetie with larger hands. There are always ways to adjust a design. Like picking a wider or thinner band, going for a larger or smaller center stone, adding a halo or side stones, etc. So most importantly, get a style she loves, and then make adjustments based on her hand type. The perfect engagement ring is about balancing budget with style. 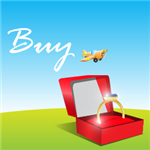 Read on for suggestions on how to find the best ring at every price point. 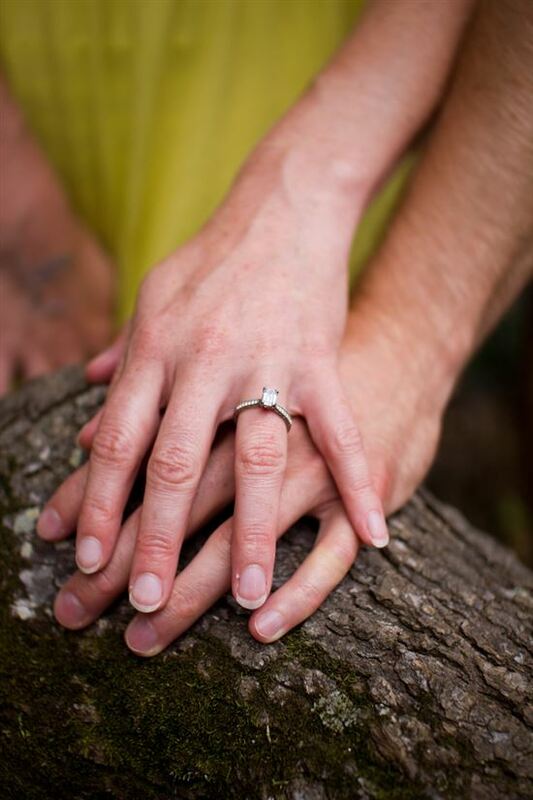 Share on Facebook "Most Flattering Engagement Rings for Every Hand"